When I was a little red-headed baby, my mom desperately hoped that my hair would darken, because she'd heard that redheads were at high risk of skin cancer. My hair did get darker over time, but my skin didn't, and so sunscreen for me has become a daily ritual. And I've finally found one I like. I spent my adolescence and early twenties slathering myself in sunscreens that, while they might keep my skin from boiling off my body like the exoskeleton of a cooked crawfish, left behind in place of blisters a greasy, shiny slime. And since my face is kind of oily to begin with, I ended up skipping sunscreen when I wanted to look good — which sometimes meant looking burned. Then I found Neutrogena Ultra Sheer Dry-Touch sunscreen. It is in fact both sheer and dry, and it allows me to touch my face without feeling disgusted with myself. I used it daily for years. Now that I work in an office and spent less time in daylight, I've downgraded to an SPF 15 moisturizer for daily wear, but the Neutrogena Ultra Sheer comes out on weekends, and any time I'm going to be in the sun. I try very hard to avoid putting any other sunscreen on my face. I tend to go with SPF 30, though I've used the 45 with similar satisfaction. A warning, though: the time I bought SPF 70, I found it left a white residue on my face that left me looking even more ghostly than before. A bottle of Neutrogena might set you back slightly more than a drugstore store brand, but it is worth it. I'm a big fan of store brands for almost everything, but I've found that generic "dry touch" sunscreens are just not as dry. And even if it's a couple extra bucks, it's still way less than the designer-y sunblocks magazines often recommend. 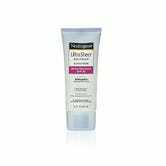 Neutrogena Ultra Sheer Dry-Touch Sunblock SPF 30, $7.07 at Amazon.